Discussion in 'The War In The Air' started by spidge, Aug 28, 2011. Geoff, I have Sgt L.R.B. Lee 1212863 (RAF, VR) , down as a survivor from this crash. An uncle of mine saw the aircraft fly over their land as it went down on the target moored off Boa Islands Dreenan shore. Attached Sgt, Sherry and the watch tower which still stands watch over the area on which FP193 crashed and a memorial stone three miles NE of Omagh marking the location of the crash of FP239 on 30/12/42. I thought so but needed to confirm. The info I had listed him as dying and only three survivors. Interestingly there was another "Bagley" killed on the same aircraft. Bagley is not a name you see every day of the week and as you say Geoff , two on the one crew. Sadly some of the crew were not recovered until some months later, poor Sgt. Sherry being one. Edited with some corrections from James S.
Aircraft took off from Castle Archdale and crashed at Lough an Laban, Enniskillen at 0715 with eight deaths and two survivors. of Irvinestown is in the north of County Fermanagh, 12kms north of Enniskillen. Son of A. S. Lloyd and Lilian Lloyd. Accountant. Son of Mr. and Mrs. H. T. Tribble, of Dorking. Son of Horace Hurstfield Sharp and Justine Sharp, of Burwood, Victoria, Australia. Son of John and Amelia Slack; husband of Margaret Slack, of East Stanley. Son of James Beckett Geldert and Ann Ellen Geldert, of Morecambe; husband of Marie Geldert, of Morecambe. Son of George and May Marshall; nephew of Mrs. A. J. Marshall, of Chichester. Son of Edward and Ethel Nater, of Newbury Park. Son of Charles Gadd Deem and Elsie May Deem, of Wellington; husband of Muriel Jane Deem, of Wetherby Yorkshire. Geoff, the crew I have for this 202 cat. W/O Ernest Slack Nav/Bbr , 31, 1109089 RAF (VR). F/Sgt John William Geldert Fe, 28, 967135 RAF (VR). F/lt. George Vincent Forbes-Llyod Pilot 29, 115835 RAF (VR). Sgt. 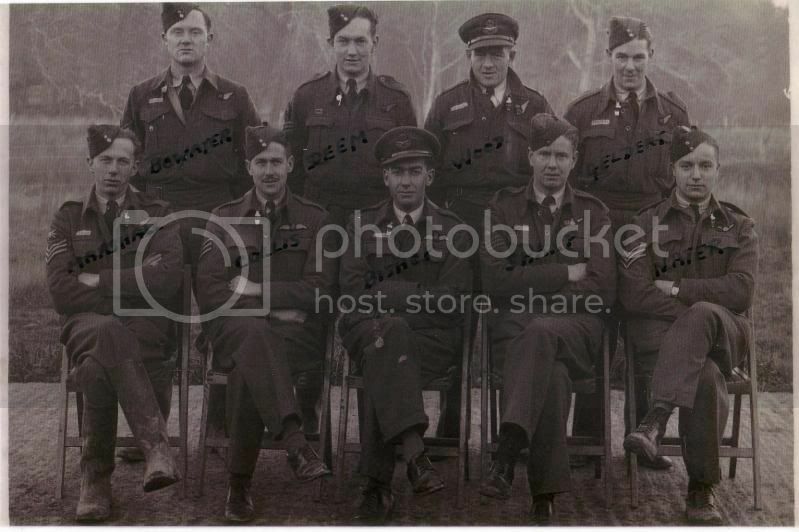 Douglas William Nater W.Op, 22, 1339183 RAF (VR). F/Sgt Gordon William Tribble. 2nd Pilot 21, 1802210 RAF (VR). F/Sgt Peter Bryan Marshall. Wop/FME 21, 578191 RAF (VR). Sgt. Fred James Deem Wop. 23, 1320050 RAF (VR). Survivors Moore and Bowater as mentioned in your listing. Memorial to the crew and that of a 201 Squadron aircraft which crashed in deep water close to the South Shore. 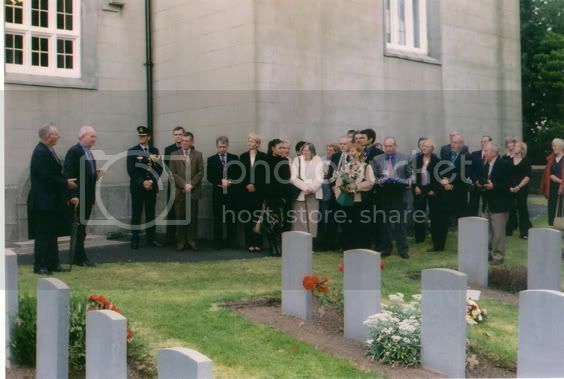 Guests at a memorial service for the 202 Squadron crew in Irvinestown. ( 2007). 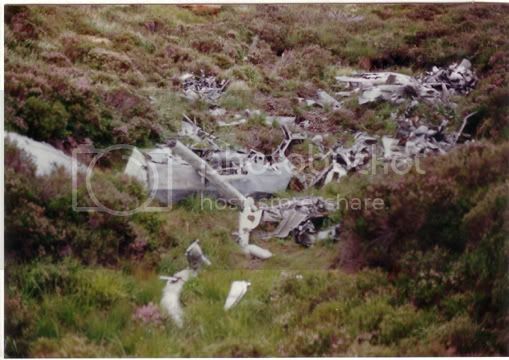 Wreckage from the aircraft which was transporetd from the crash site to a remote hillside , a hole was blown in the bog land and the wreckage dumped into it. A sad loss so close to the end of the war, fatigue IMO. Eire. The aircraft and all engines were totally destroyed. north of the County Fermanagh, 12kms north of Enniskillen. Flt Sgt Twist is buried in the Llanfair Caereinion Cemetery, UK. of the City of Nottingham. Flt Ford is buried in the Taunton (St Mary) Churchyard, UK. Sgt J McAvoy is buried in the Glasgow (St.Peter's) Roman Catholic Cemetery. Son of Richard George and Minnie Florence Hatton, of Skegness, Lincolnshire. Son of George Albert and Jean Lindsay Becker, of Pouce Coupe, British Columbia, Canada. Son of Bernard and Marjorie Frith, of Sheffield. Son of Arthur Edward and Ellen Howkins; husband of Annie Howkins, of Ampleforth, Yorkshire. Son of Frank Millshamp Twist and Agnes Mary Twist, of Llanfair Caereinion. Son of Edward George and Florence Annie Cave; husband of Elsie Marion Cave, of Grays, Essex. Son of Robert Kelly Davison and Jane Davison, of West Hartlepool, Co. Durham. Son of James Ernest and Annie Robinson; husband of Doreen Robinson, of Hucknall. Son of George and Mary Wales McAvoy, of Glasgow. Son of Edward and Annie Maria Kennedy, of Hanwell, Middlesex. Son of Frederick and Elizabeth Ford, of Taunton. 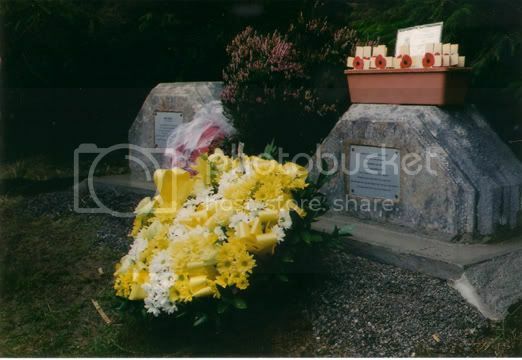 This is the start of the County Londonderry Deaths of which there were (9) deaths in (3) cemeteries. Causeway, Antrim, Northern Ireland, and the crew of two were killed. obscure, but it was considered to be probably an error of judgement on the Captains part. Churchyard, Limavady, Londonderry, Northern Ireland. Son of William Ogden Twentyman and Millicent Agnes Twentyman, of Hukanui, Wellington, New Zealand. Son of James Luke and Rosanna Amelia Pither, of Shepparton, Victoria, Australia. dropping one wing and dived into the ground. Sgt Samuel is buried in the Carnmoney Jewish Cemetery, UK. Sgt Highfield is buried in the New Shildon (All Saints) Cemetery, UK. Sgt Clark is buried in the Limavady (St Mary) Roman Catholic Church Cemetery, UK. Sgt Greenwood is buried is buried in the Mankinholes Methodist Chapelyard, UK. Son of Harold and Rose Samuels, of Montreal, Province of Quebec, Canada. Son of William Weston Milsom and Mary Alice Milsom, of Bromborough. Son of Eugene Wallace Berger and Grace Gertrude Plaskitt Berger, of Toorak, Victoria, Australia. Son of Francis and Agnes Highfield; husband of Mildred Highfield of Shildon. Son of Joseph and Grace Evelyn Clark, of Eccles, Lancashire. Son of Sarah H. Greenwood, of Todmorden. Ballycastle, County Antrim, North Ireland. Two of the crew were killed and two injured. fact not known to the crew. I decided to descend to 2,000 feet to avoid another aircraft. Son of Eric William and Olive Marion Clarke; husband of Vivian Myrtle Clarke, of Banyo, Queensland, Australia. No details on the burial place of this Polish officer. Walsh was killed, and the remainder were injured. to blame for the accident. Son of John Joseph and Mary Madeline Walsh, of Enfield, New South Wales, Australia. Ballintrae, County Antrim, Northern Ireland. All the crew lost their lives. Flt Sgt Woods body and that of Sgt Stout were washed ashore. Sgt Stout is buried in the Chingford Mount Cemetery, UK. to the Missing, Runnymede, UK. Son of Samuel and Annie Doris Waite, of Harrogate, Yorkshire. Son of Nelson and Madge Knight, of Hampton Wick, Middlesex. Son of Henry and Mary Woods; husband of Elsie May Woods, of Mount Tamborine, Queensland, Australia. Son of James Wright Marshall and Jane Marshall, of Highett, Victoria, Australia. Chemist. Son of Frederick William and Eleanor May Stout; husband of Jean Stout, of Leyton. and the aircraft was seen to climb up to about this height after take off. 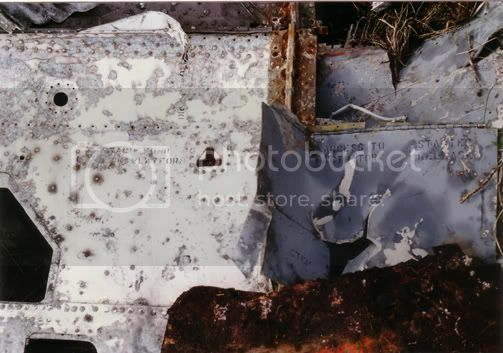 The aircraft crashed off Melville, County Donegal, Ireland, and all the crew were killed. Church of Ireland, County Londonderry, Northern Ireland, UK. Flt Sgt Anderson is buried in the Dunfermline Cemetery, Fifeshire, UK. Sgt Cook is buried in the London Colney (St Peter) Churchyard, Hertfordshire, UK. FO Parsons is buried in the Bradford (Bowling) Cemetery Yorkshire, UK. Flt Sgt Utting is buried in the Hucknall Cemetery, Nottinghamshire, UK. Son of John Francis and Maud Mary Wade; husband of Zelie Nienes Cockburn Wade, of Pewsey, Wiltshire. Son of Henry and Violet H. H. Anderson, of Kelty. Son of Edward and Jane Haines, of Deptford, London. see STEER, the true family name. (served as UTTING). Son of James and Elizabeth Steer, of Hucknall. Son of John and Margery Cook, of London Colney. Son of Marwood and Ruth Parsons, of Bradford; husband of Katherine Irene Parsons, of Lidget Green, Bradford. Foster-son of Anders Nielsen and Evelyn Ruth Apitz, of Hamilton, New South Wales, Australia. Son of Alfred Ernest and Rhoda May Cooper, of Tingha, New South Wales, Australia. carry out an operational patrol over the sea at night in an area north west of Ireland.. Son of John Charles and Hilda Grace Baxter; husband of Kathleen Rose Baxter, of Kentish Town, London. Son of Joseph James Jerrard and Maggie Jerrard, of Chideock, Dorsetshire. Son of Daniel Robert and Priscilla Elizabeth Weeks, of Ballarat, Victoria, Australia; husband of Nancy May Weeks, of Manly Vale, New South Wales, Australia. Son of Robert and Margaret Lawrence, of Dululu, Queensland, Australia. Son of James and Esther Hall, of Bolton, Lancashire. Son of William Henry and Alice Margaret Pike, of Buchans, Newfoundland. WO Pennack is buried in the Southend-on-Sea (Sutton Road) Cemetery, UK. Sgt Button is buried in the Bolsterstone (St Mary) Churchyard, UK. Son of Alexander and Catherine MacFadyen, of Port Arthur, Ontario, Canada. Son of Alexander Joseph and Eleanor Grace Gillian, of Bondi, New South Wales, Australia. Son of Henry Pennack and of Nellie Gwenoth Pennack (nee Hyde), of Southend-on-Sea, husband of Lesbia Kathleen Pennack, of Southchurch, Southend-on-Sea. Son of Horace and Blanche Button of Deepcar. MF396 was Struck Off Charge 24th May 1945. The information sent to Australia was extremely difficult to decipher and much worse using copied documents. Predominantly with surnames and initials and local place names which I have been able to confirm with the CWGC database and a little geographical knowledge.